The Horizon Zero Dawn board game has not only met its funding goal, it continues to smash right through it! With an original goal of just over $202,000, at the time this article was written it soared over one million dollars! The PlayStation 4 exclusive is coming to a tabletop near you from Steamforged Games. The announcement went live during Gen Con 2018 and since then, the crowd funding fun went wild. The team behind other great tabletop re-imaginings such as Dark Souls and Resident Evil is bringing Aloy and friends into the hearts and homes of many once more. You can see a demo playthrough with the creators themselves in the video at the top of the article, but for fans of the incredible journey given to us on the PS4 - this next step is the perfect way to take that love to the next level. "Each hunter has a distinct playstyle with a unique set of strengths and weaknesses. 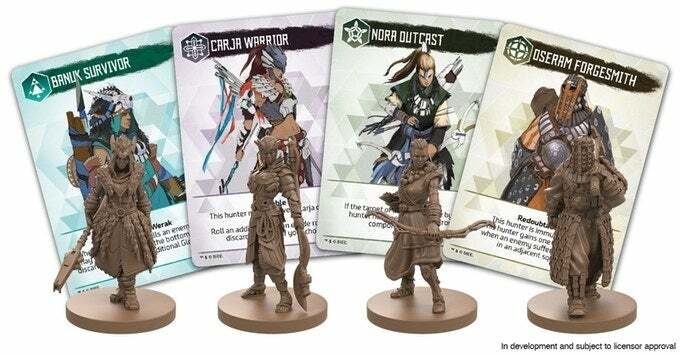 The Nora Outcast is a highly skilled and resourceful archer; the Banuk Survivor lives on a knife edge, pushing themselves to the absolute limit. The Carja Warrior is a flashy but lethal duellist, and the Oseram Forgesmith smashes their enemies around with powerful sledgehammer blows." It won't be a simple game either, but one rife with choice and consequence. The team added, "Choosing a path to follow from the Tracking Deck offers players a difficult choice. They can choose to take the easy path, progressing with little resistance but earning few resources to spend with the merchants or to boost their attacks; or they can take a more challenging trail, encountering more formidable adversaries. Overcoming these foes will not be easy, but can earn precious materials to empower the hunters for their next encounter. The choice is yours…"
"Quick to learn, difficult to master," the Horizon Zero Dawn Board Game is making some serious headway and that popularity only continues to climb with amazing backer rewards and unique incentives. To join the fray, check out their Kickstarter page right here to pledge your own support and get that sweet, sweet loot. Learn more here!